AVGO Free Video Converter is a complete converter program that can convert all video file formats to a file format supported by most portable devices. It can convert all audio/video file between 400+ formats and 200+ devices formats, including MP3 MP4 AVI 3GP MKV DVD and more. Know the advantages of using the best free software converter and get amazing results now! As the product name implies, this powerful video converter is absolutely free which means that there are no monthly or annual subscription fee required or whatsoever! This video converter can convert any video or audio file format input and can output to 400+ formats such as MP3, MP4, AVI, MKV, DVD , FLV (YouTube), etc. 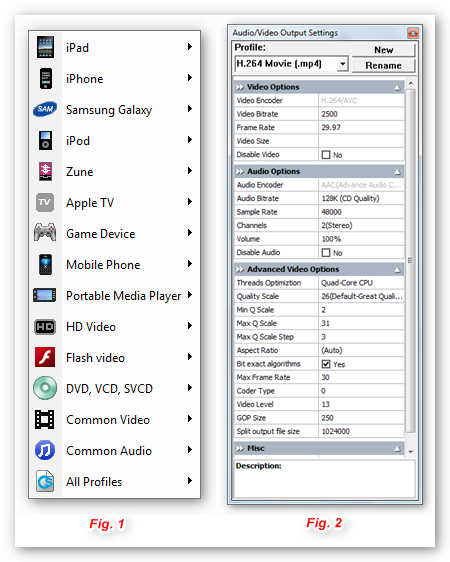 Support for 200+ devices including a specific profile setting (see Fig.1) for the most popular devices like iPad, iPod, iPhone, PSP,Samsung, Android devices and so much more. Although this video converter may seem advance, even beginners will find it very easy to use as it is designed with a simple and non-complicated user interface. Unlike most video converter freeware, Free Video Converter is guaranteed safe to download (no malware, spyware, adware, etc.). Also, it does not require any 3rd party software like most online video converters. Download AVGO Free Video Converter now to start converting and watching your favorite video collection on your gadgets anywhere you go. We always have your best interest in mind and we would love to hear your thoughts on what we can do to improve our future software updates and upcoming program releases. We would also appreciate any support you can give us so we can continue on finding ways to serve you better. best free video converter ever. great work, thanks a lot! This tool is Very good and excellent converter;keep it thank you ! I like it very much, thanks!!! Terribly good video converter, really does a fine job! And lots of choices concerning the file output. Verry good and excellent converter;keep it up and thanks A lot. looking forward to enjoying the experience with avgo.Thanks a lot for this free software. Free DVD Video Software , USA 4.8 5.0 17 17 best free video converter ever. great work, thanks a lot!